ANSYS SpaceClaim brings 3D solid modeling to the desktops of engineers and analysts who work in 3D, with a simplicity and low TCO (Total Cost of Ownership) never seen before in CAD. With the new Shrinkwrap Tool, you can instantly clean up models for 3D printing by creating a watertight, regular faceting around selected bodies. Now you can prepare extremely noisy scanned data or poor quality CAD files for printing in seconds, not hours or days. When making a 3D prototype, rarely is the CAD design ready for 3D printing. In the past, many model shops had to wrestle with complicated CAD systems or make the edits right on the mesh. Neither is an ideal solution. 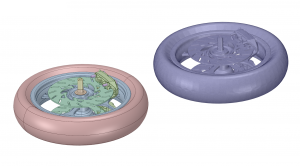 SpaceClaim provides a thorough suite of tools to get geometry ready for 3D printing. An intuitive interface allows users to create, edit, and prepare models for 3D printing faster and more efficiently than ever before. With an STL Prep Module, users can work directly with STL files as well as leverage many automated prep tools for 3D printing applications. The STL Prep for 3D Printing module prepares models for 3D printing efficiently and easily by offering a single solution that not only repairs problems, but also modifies STL and CAD files.